Nippon Energy is one of the reputed brand to install solar panels in Mission Viejo. The solar powered systems convert light energy into electrical energy through a process known as the Photovoltaic Process. In this process, photo or the radiation energy is absorbed by the solar cells and electricity is generated. The solar panels are dependent on the photoelectric effect, the power of a matter to give off electrons when exposed to light. 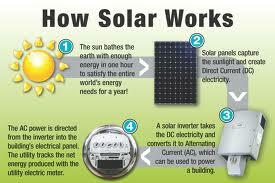 It is very important to know atleast the basic before you are ready to install solar panels in Mission Viejo. The solar panel consists of a series of solar cells or Photovoltaic Cells arranged in an array to receive sunlight. They are generally composed of silicon which acts as a semiconductor agent. When the sunlight strikes these cells some amount of energy is absorbed in them. This helps the electrons to be set loose and allows them to move about freely. These loose electrons help to generate an electric current or Direct Current. The direct current (DC) that is generated in the solar cells is then transferred into an inverter. The inverter is the most crucial member of the solar system. The main task of the inverter is to convert this Direct Current into Alternate Current (AC). This current is the favorable form of current that is used by our household electrical goods. The Alternating Current derived from the inverter is then connected to the main electrical grid of the house. This is how all the electrical appliances receive current. If there is any excess current, it will return to the electrical grid and the meter will calculate backwards. In addition to all the above towards solar panels isntallation in Mission Viejo, there is a system which monitors the entire process and checks the power generated by the solar systems. The electrical output can also be monitored through the internet by applying for it online.